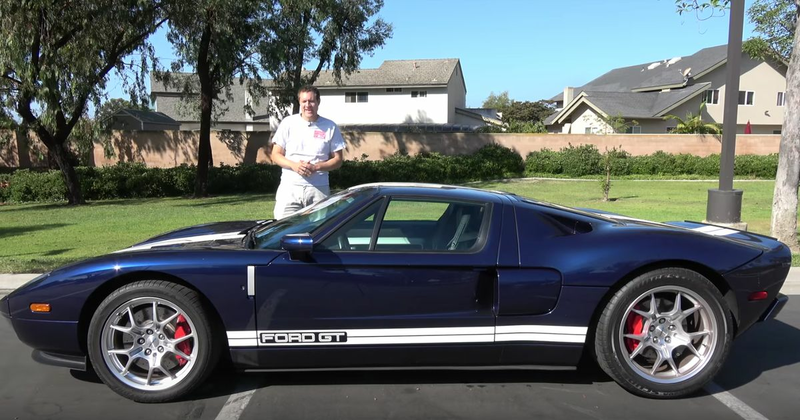 While “Hey, look, I bought a supercar!” videos are ridiculously common on YouTube, buying a Ford GT is a much bigger deal for Doug DeMuro, the man insists here. He says he agonised over the decision, eventually caving and buying the very same 2005 example featured in his comparison video with the new GT. He attributes being able to afford it to not drinking, not clubbing and wearing less than fashionable clothes. How about that for sacrifice? With 31,000 miles on the clock, it’s reasonably well-travelled for a car like this, but that’s fine, as DeMuro intends to actually drive the thing rather than stuffing it away in an air-conditioned garage. And yes, there are indeed quirks. We don’t get quite as thorough an examination here as usual - since Doug’s did the honours with another GT a couple of years ago - but we get a few interesting nuggets. We have award frunk access, equally awkward fuel filler access, and - of course - all the various bits and pieces from the Ford parts bin. A $150k supercar with Focus indicator stalks? You betcha. Doug’s promised to be doing regular updates on the GT on his new channel ‘More Doug DeMuro’, where you can find, erm, more Doug DeMuro. We can’t wait to see what he gets up to with the car.